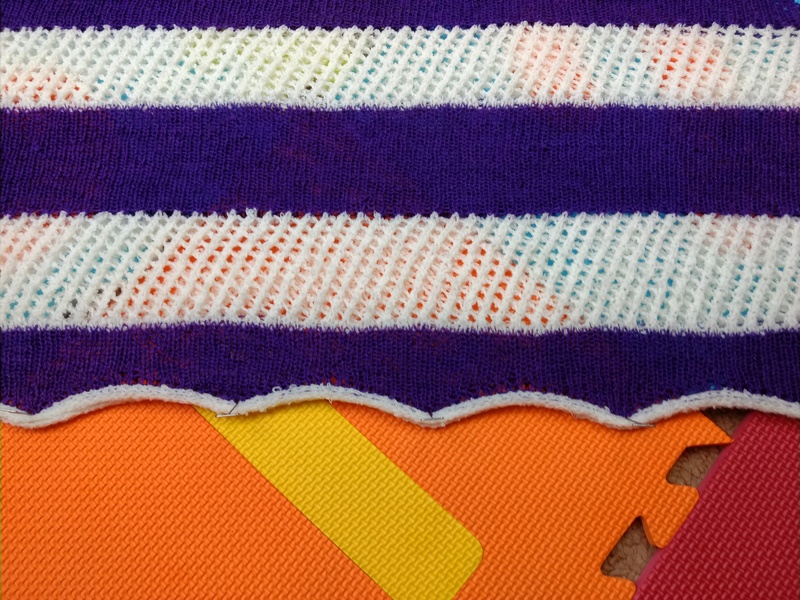 Blocking is basically the secret to creating perfect finished pieces! Have you ever knitted (or crocheted) something that you’ve taken hours to make and poured your heart and soul into, just to end up with a wonky, lumpy looking thing that wasn’t what you’d pictured at all? Don’t panic and throw it in the naughty corner in despair, that’s where the magic of blocking comes in! Blocking is simply the process of thoroughly wetting your finished creation, then gently stretching it to the right size and pinning it in place while it dries. This is an important step as it helps relax the yarn and evens out minor tension issues, and it can help get your finished piece to exactly the right size (which is obviously more important for a garment like a jumper, than a shawl). Here I am going to talk specifically about blocking the Snakes and Ladders shawl, which is knitted in linen yarn. You can find out more about this pattern and buy it on Ravelry here. There are various tools you can buy to make blocking easier, but all you really need is a flat surface and some pins. I recently invested in some T-pins (mainly to stop me bending my sewing pins from over enthusiastic blocking!) 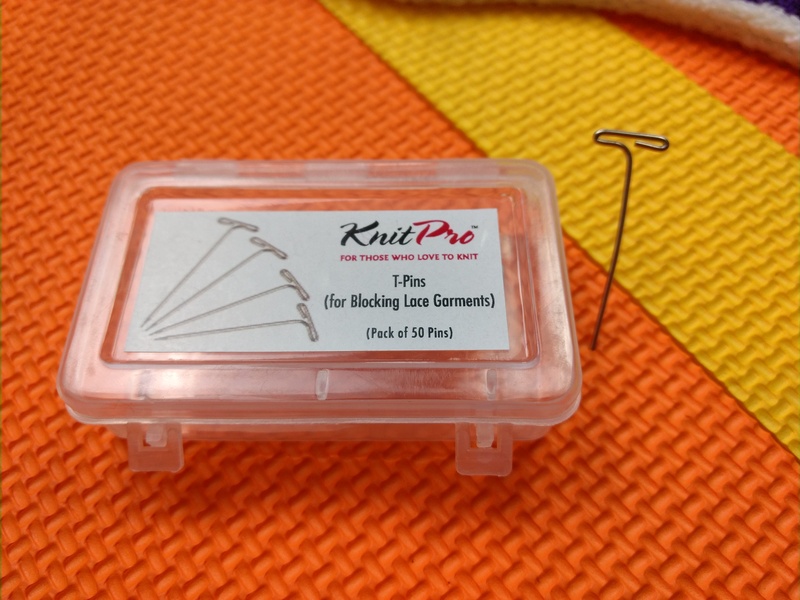 These pins are sturdier than sewing pins, with a T shape at the top for ease of use. (This post isn’t sponsored by the way, I bought these pins because I wanted them!). I also lay my projects out on these foam mats, which are exactly the same material as blocking mats, the only difference is they have numbers in the centre of each square (and I bought them for my kids in the charity shop for £1!). But a large towel on the floor also works just fine as a base. You can buy various other blocking aids such as flexible wires which are useful for blocking curved edges. 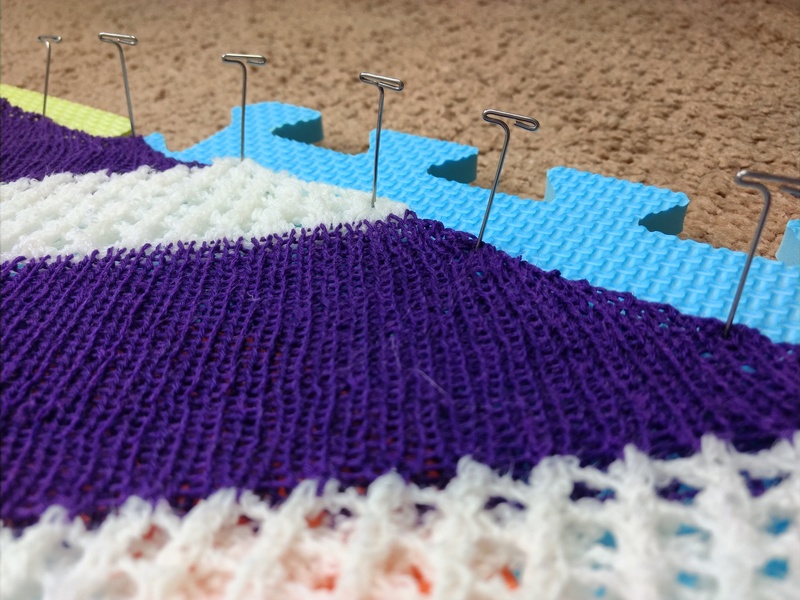 Once you have your base set up and your pins to hand, lay your thoroughly wetted shawl on the mat and stretch it out to roughly the right shape. I blocked mine folded in half so that it would turn out exactly symmetrical. Then starting from the top centre, pin and stretch as you go, maintaining the triangular shape of the shawl. You will probably find that you need to stretch it more sideways then lengthways to achieve the right shaping. It’s best to not leave too big a gap between pins, especially on a piece that is being stretched quite a lot, as you will end up with an unintentional picot edging! By pinning your shawl at smaller intervals you reduce the tension on the fabric around each individual pin. When you get to the edge you will need one pin at the apex of each triangle to help shape them. The best way to do this is to start with pins in each end, then in the middle, then at roughly 1/4 and 3/4, and finally the rest. This should maintain an even spacing, and stop any one triangle getting more stretched than the others. Once your shawl is dried it’s now ready to wear! You may find the linen is a little stiff feeling initially, but with a little breaking in the fibres will soften up beautifully, giving you a truly delightful summer shawl! 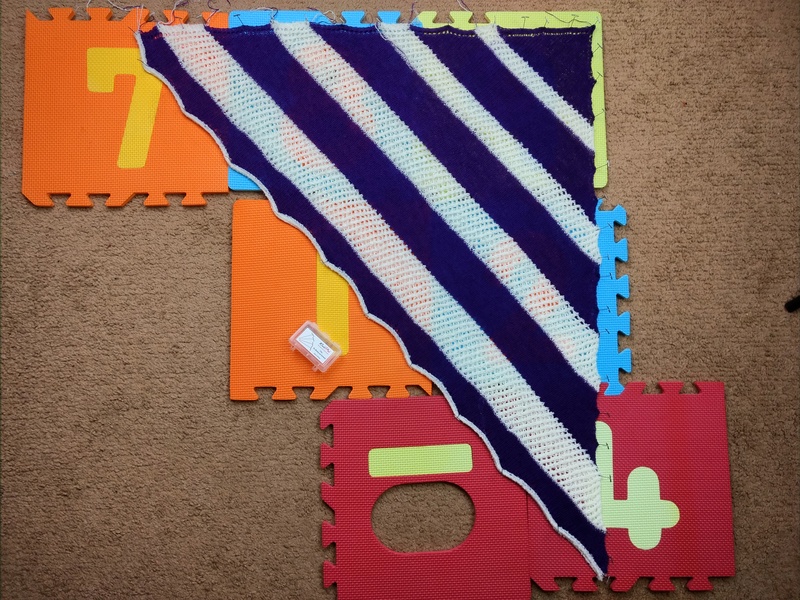 Have you made a Snakes and Ladders shawl? I’d love to see it! If you share it, please do tag me on instagram @flora_fibres_yarn or use the hashtag #snakesandladdersshawl, and if you upload your project to Ravelry remember to link to the pattern page so we can all see! Leave a comment What is blocking anyway? It’s beginning to feel like summer is just around the corner! Hooray! It’s definitely my favourite season: the long, long days are my favourite, even if our weather here in Scotland isn’t the best! To celebrate the beginning of the season (and also Flora Fibres first birthday!) 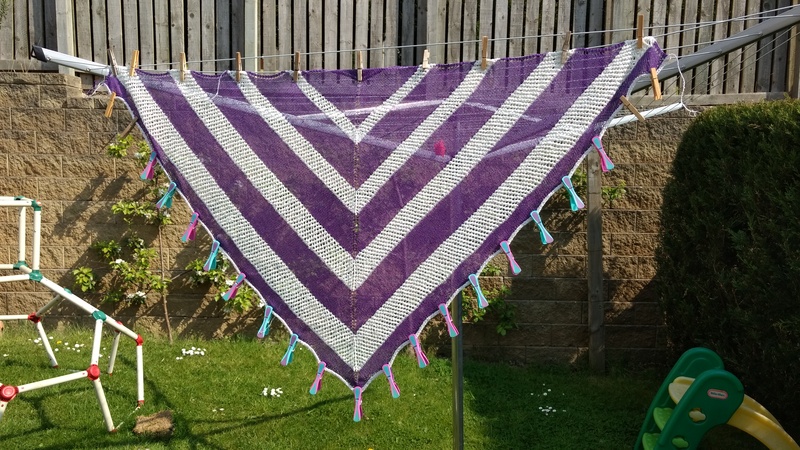 I have designed the Snakes and Ladders shawl: a lovely triangular linen shawl which will be the perfect summer accessory. It is lightweight and airy, and the natural linen will help keep you cosy if there’s ​a chill, but won’t let you overheat. The pattern will be released on the 14th of May (Flora Fibres first birthday! ), and you’ll be able to get your copy from my Ravelry store. You’ll also have heard me going on about joining my mailing list, and if you haven’t yet done so, let me give you some incentives! Aaand one lucky subscriber will be chosen at random to win their choice of either a voucher for my Etsy store, or a free knitting pattern! Sign up today to make sure you don’t miss out! Leave a comment New shawl pattern and birthday celebrations!